Whether it's designing a commercial sustainability garden, creating an edible landscape or a "water smart" garden with "California-friendly" and native plants, we can show you how easy it is to be a successful gardener in your own backyard or business! Easy Chart on How to Use the Herbs from your Garden…and Spices Too! What would our culinary creations be without the pretty pepper? An essential ingredient in my summer edible landscapes, these beauties can be sweet or hot, small or large, and very, very colorful – flowers, fruit and leaves! (REMEMBER: Since this is a plant that belongs to the Solanaceae family, use crop rotation to avoid planting in the same garden area in consecutive seasons. 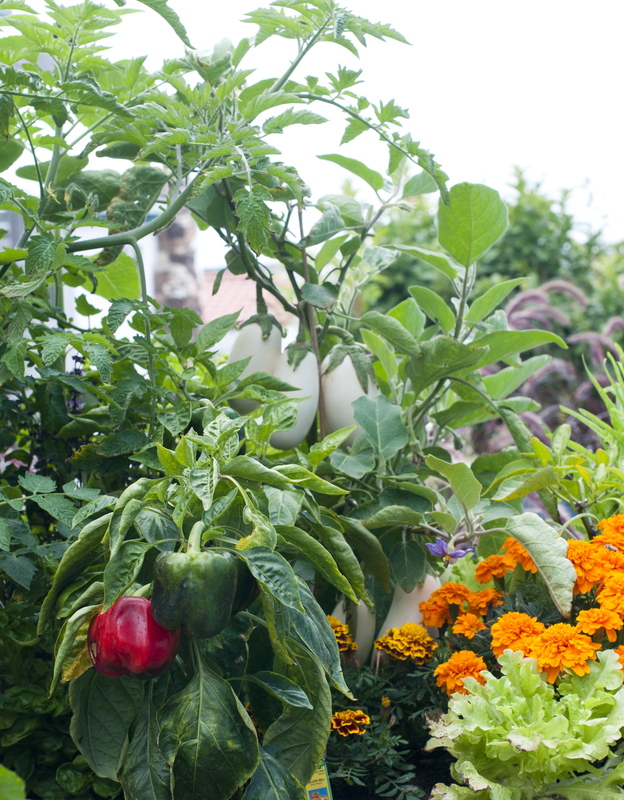 Other Solanaceae family vegetables, fruits and flowers includes: potatoes, tomatoes, eggplant, sweet peppers, chili… peppers (but not black pepper), tobacco and petunias. temperatures are 70 to 80 degrees F during the day, and 60 to 70 degrees F at night. 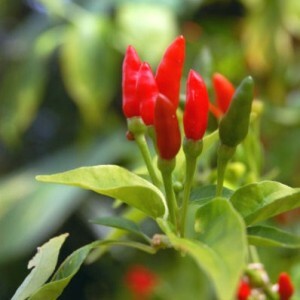 For centuries, growers have handed down methods to increase chilis pungency through slightly drought stressing plants after fruit set. Does this work? There has been some research done on this recently from New Mexico State University, College of Agricultural, Consumer and Environmental Sciences. Read more here: http://www.kasa.com/dpps/local_guide/local_guide_02/drought-stress-on-chile-draws-research_4649498. My experience has been that different varieties respond differently. I find fairly predictable responses from drought stress in Jalapenos and Serranos. For such a small chile, it packs an incredibly fiery punch. 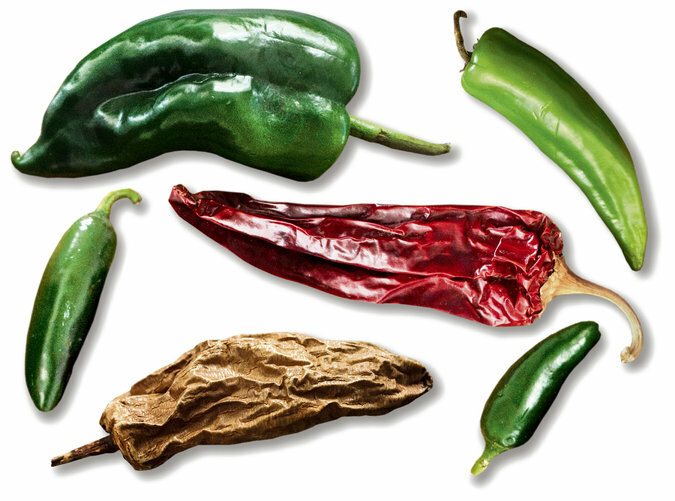 Thai chiles range in color from red to green when fully mature. They are often used in Asian curries. Thai peppers should be used sparingly. range. Adjust soil fertility as indicated by soil test results. 5-10-10 or 8-16-16 are often used for growing peppers. of true leaves. Although it’s tempting…avoid plants that already have flowers and fruit. thoroughly after transplanting. Avoid planting under conditions that will stunt the plants and lead to poor production, such as cold weather, lack of sufficient soil moisture, or lack of sufficient fertilizer. 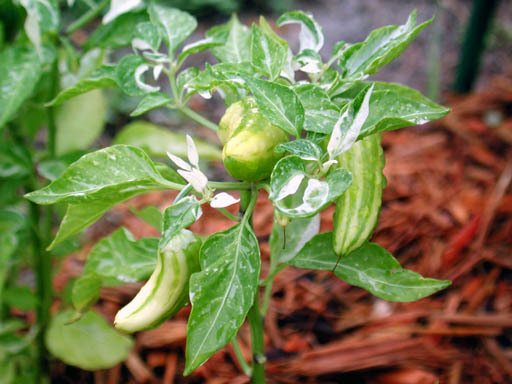 Fish Peppers (Capsicum annum) were used to season fish and shellfish in the African-American communities around Baltimore and Philadelphia back in the 1930's and 1940's. If using traditional row planting scheme, space plants 18 inches apart in rows 24 inches apart. As a bio-intensive planter, I space mine much closer together and have never had a problem (typically 6 inches apart for smaller types, 10-12 inches apart for larger). After the plants are well established, apply a mulch to conserve soil moisture, prevent soil compaction and help suppress weed growth. Once fruits have begun to set, an additional sidedressing of fertilizer will help promote greater plant productivity. dry well before evening. 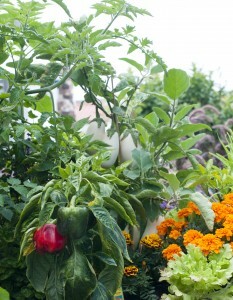 The best irrigation for veggie gardens is drip or by using soaker hoses. Check with your local Cooperative Extension for pest & disease control recommendations in your area (link to a National Database of IPM sites is below). Here is a link to UC Davis IPM site: http://www.ipm.ucdavis.edu/PMG/selectnewpest.peppers.html. Aphids should be controlled as they may carry viral diseases that can affect peppers. -Are the plants undernourished or stressed from growing too quickly? -Is there a nutrient imbalance? -Is the soil too wet or too dry? -Has a good crop rotation been followed? -Is there a diversity of plants to support beneficial insects? Studying the problem and trying to determine why it occurred should help prevent similar problems in the future. This will, of course, take time to learn and develop…gardeners are, above all else, patient. Unless you refuse to use any pesticides (we strive for this – organic or not), they may at times choose to apply some organic pesticides to save a specific crop. This is system is well-suited for organic production and one, as a Master Gardener, I always recommend. IPM is a system in which insects, diseases, and weeds are closely monitored, and different methods are used to keep pest populations at levels that are not economically damaging with minimal adverse environmental effects. IPM encompasses use of cultural and biological control methods, use of resistant varieties, and a VERY judicious use of pesticides. HGEL recommends that, In the event pesticides must be used, select ORGANIC ones with low toxicity, non-persistent residues, narrow spectrum of control, and low environmental impact. There are four regional IPM centers in the U.S. – North Central, Northeastern, Southern and Western. There is no guarantee that once an organic system is established there will never be a disease, weed, or insect problem. Stressful conditions that a gardener cannot control will occur, such as weeks of endless rains, droughts, periods of extremely high temperatures, hurricanes, plagues of grasshoppers, or hail. Likewise, if an airborne disease invades your area, your plants will probably be infected. However, with careful observation and preparation, an organic system should progressively have fewer pest problems as years go by. Peppers are normally harvested in the immature green stage (but full size) for use in relishes, salads, for stuffing, and for flavor in many cooked dishes. However, if they are allowed to ripen on the plant they will be sweeter and higher in vitamin content. Other peppers are usually harvested at full maturity. brittle. Hand clippers or pruners can be used to cut peppers from the plant to avoid breaking the stem. The number of peppers perplant varies with the variety. Bell pepper plants may produce 6 to 8 or more fruit per plant. In general, peppers have short storage life of only one to two weeks. Cool, moist conditions (45 to 50 degrees F) and 85 to 90 percent relative humidity are the ideal storage conditions for peppers. Not too hot! Chilies that add flavor – not heat. © 2009-2019 Home Grown Edible Landscapes. All Rights Reserved.